Excellent Breckenridge Golf Club Location! Just shy of Breckenridge Main Street you will find Highland Greens, a 1500 square foot, 3 bedrooms 2.5 bath that is simply beautiful. Located near the Breckenridge golf course this condo that sleeps up to 8 is perfect for your family or friend’s next vacation to the High Country! With mountain and ski area views you will surely find yourself comfortable here! The private hot tub on the back deck overlooks the gorgeous surrounding mountains while the serenity of Colorado welcomes you. 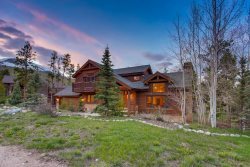 This property is located within a close proximity to a Summit Stage bus stop, which can take you anywhere in the county while the Free Private Shuttle service is available for you to take into the heart of Breckenridge. On the main floor, you will find a well-appointed kitchen to whip up a fantastic meal and a gorgeous dining room, as well as the living room with a television and fireplace to wind down after a long day on the mountain. The main level is an open floor concept which keeps everyone involved in the fun. Upstairs you will find the bedrooms. The master bedroom has a King bed and a private master bathroom with a bathtub to soak your worries away. The second bedroom has a Queen bed and the 3rd bedroom has a bunk beds with a double on the bottom and twin on the top, plus another twin bed. The bathroom is shared between these 2 rooms. The washer and dryer in unit also make this property feel more like home while you are with us. And an added bonus is the private garage to park your car so it will always be warm for you in the mornings, even after a big snow storm! - Free-private shuttle that takes you from your front door to the slopes! - 3 VCRs and 4 DVD players.